Crafting a brand new science fiction story can feel incredibly chaotic — like wresting life out of the primordial ooze with your bare hands. Which is why this infographic about the life cycle of a science fiction story, including writing and the submission process, is so thrilling and helpful. This chart comes from Wonderbook: The Illustrated Guide to Creating Imaginative Fiction by Jeff VanderMeer and illustrator Jeremy Zerfoss. The book "exploits the visual nature of fantasy through original drawings, maps, renderings, and exercises to create a spectacularly beautiful and inspiring object." And there are interviews with everybody from Neil Gaiman to George R.R. Martin to Karen Joy Fowler. An attempt to fuse the practical and the impractical — to create something that is intrinsically fun just for its own sake, but that also provides what any beginning or intermediate writer might need to work on the craft and art of their writing. I wanted it to have stories spiraling through it as well in the text, so the text would evoke images as well — you'll note that a talking penguin is a recurring character in the text, among other characters. That also speaks to the idea of so many books being so serious — you can be deeply non-serious and still focused, disciplined, and on task. I also wanted the book to feature its own insurgency, so the disruption dragons, and their text, begin to call into question aspects of my main text. This is the normal process with a writing book: writer encounters it and agrees with some things and disagrees with others. In that confluence — knowing what resonates for you and what doesn't — you find out who you are as a writer. 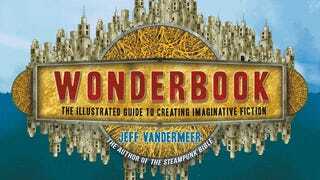 I also hope that Wonderbook is a celebration of creativity that interests non-writers. Some of the exercises in particular are meant to energize and inspire someone who might like to write a story but not pursue a career as a writer. And I think this is true to what creativity is all about, because we all tell stories to each other. Check out another chart from the book — "revision snakes" that show just how many times each author had to revise one of his or her famous novels. Click to enlarge!